The scaffolding is down and the pergola is on its way to being finished – it has been a busy week on site! The building is beginning to look like the original concept sketches that Tom did almost a year ago. We only have a week left in France before we head back to the UK. There are still a few things that we need to sort before we go because we will not be back until Easter. It is hard to choose tiles and flooring when you are not around to see them in the shop. Still, this as finally been decided as has our hedging, decking and walling! We have an air tightness test booked for next week as well. 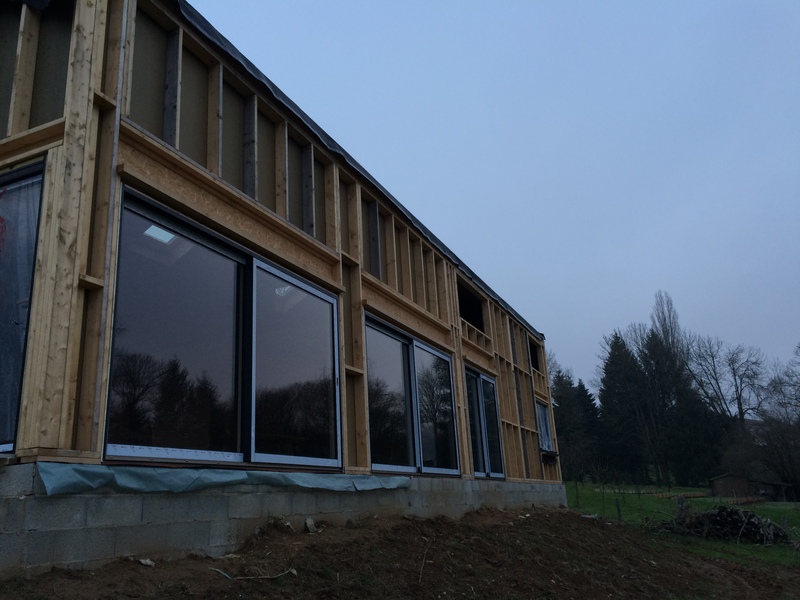 Achieving a good level of air tightness is important for the energy efficiency of the building. The benefits of improved insulation and more energy efficient heating systems are lost if warm air can leak out of the building and cold air can leak in. Too much air leakage can lead to unnecessary heat loss and possible discomfort in the house which you would feel as draughts. The test involves regulating air pressure inside the house. They do this by fitting a temporary airtight screen to our front door. They then mount a big fan to the screen which blows air in to and out of our house so that they can create a pressure difference between the inside and outside of 50 Pascals. There is then some more complicated maths to do. To pass an air leakage test in England and Wales, a home must achieve an air permeability result of 10 m3/(h.m2). We hoped to achieve 3 m3/(h.m2)! We’ll let you know how it goes. Categories: Construction, French builders, House Construction, Marandat, Timber Frame | Tags: Air tightness, Pergola, Timber cladding | Permalink. 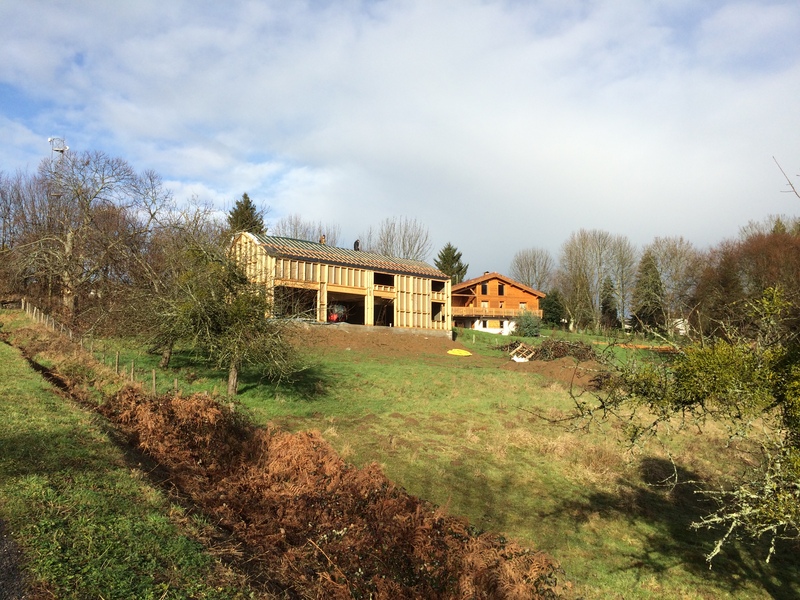 The last couple of weeks in the Charente have been glorious, this has meant that our carpenters have been able to make a good start to the timber cladding on our house. 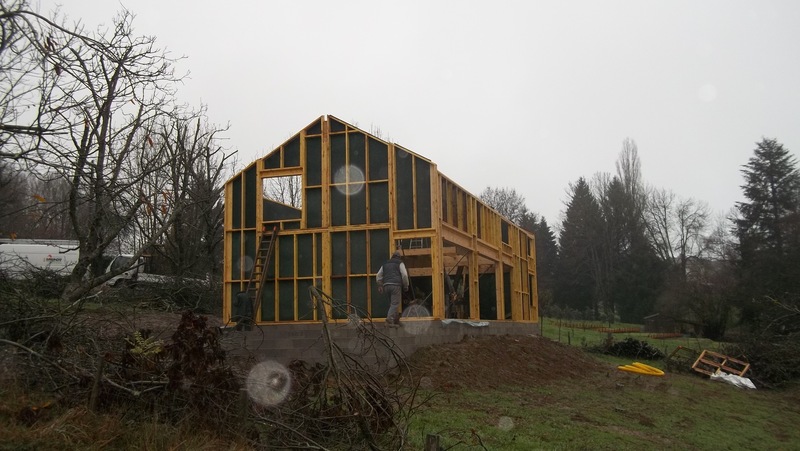 The whole building, including the roof is going to be clad in Douglas fir. 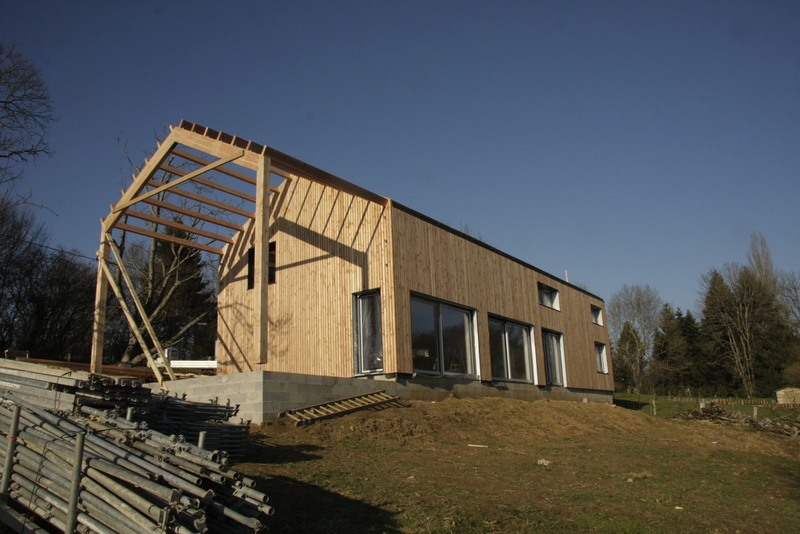 When we were first discussing the cladding with Marandat, we had the choice of using Larch or Douglas Fir. Initially the Larch cladding does look a little less bright, but as soon as the start to go grey the two woods will look the same. We therefore decided on Douglas Fir because it was cheaper, but just as good. 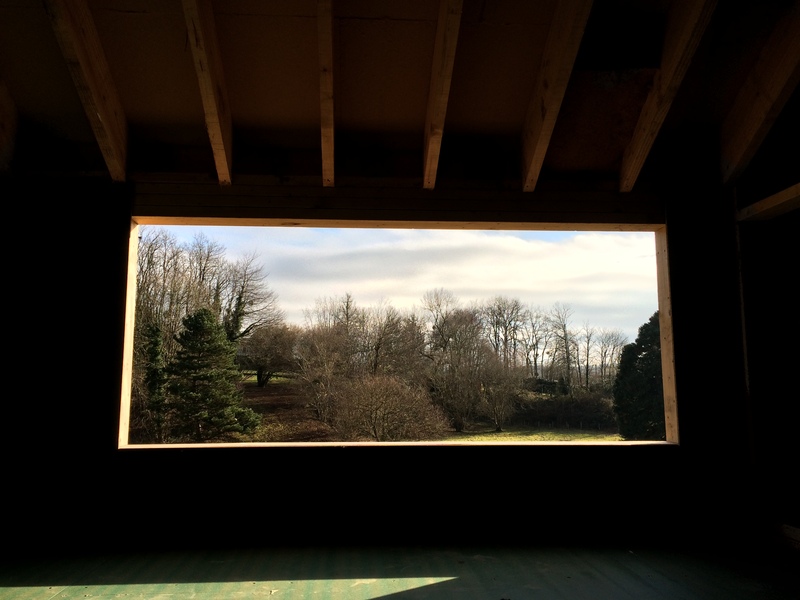 Tom designed the timber façade to be open jointed rather than tongue and grove to give the impression of depth, this meant that the setting out of the cladding took a lot of working out and a bit of complicated maths! 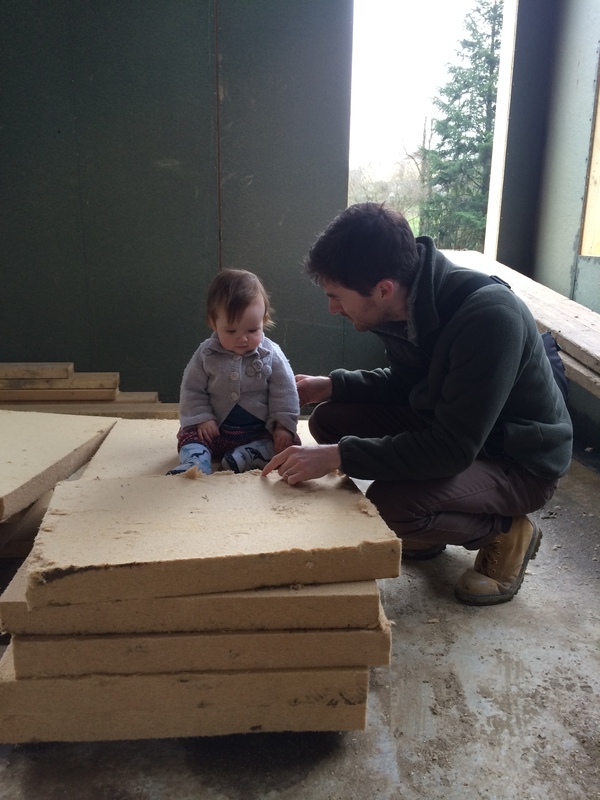 Tom and Claude from Marandat eventually agreed on spacing the battens 15mm apart. 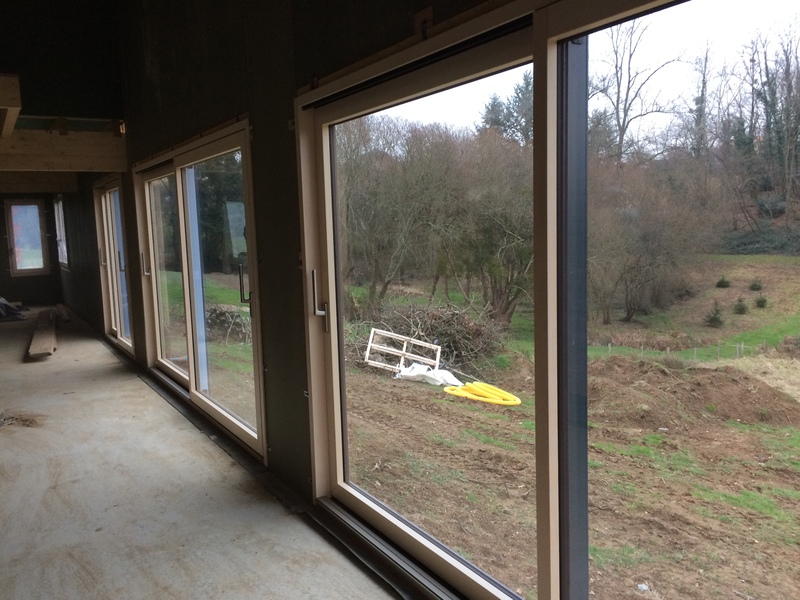 To ensure the timber battens were equally spaced to the nearest 15mm each section of the building had to be measured and then divided by the spacing, while taking in to account the width of the battens. Hopefully, once the cladding has finished, nobody will notice if the spacing is a few hundredths of a mm out in some places! What you see in these photos is not the finished product, the edges will be neatened up to be the same length and then the ends will be covered with flashing. The south and west sides that have been put up have already started to lose their slightly pinkish colour. This does mean that the wood will be changing colour at different rates, but it all happens so quickly that it will not be noticeable for very long. 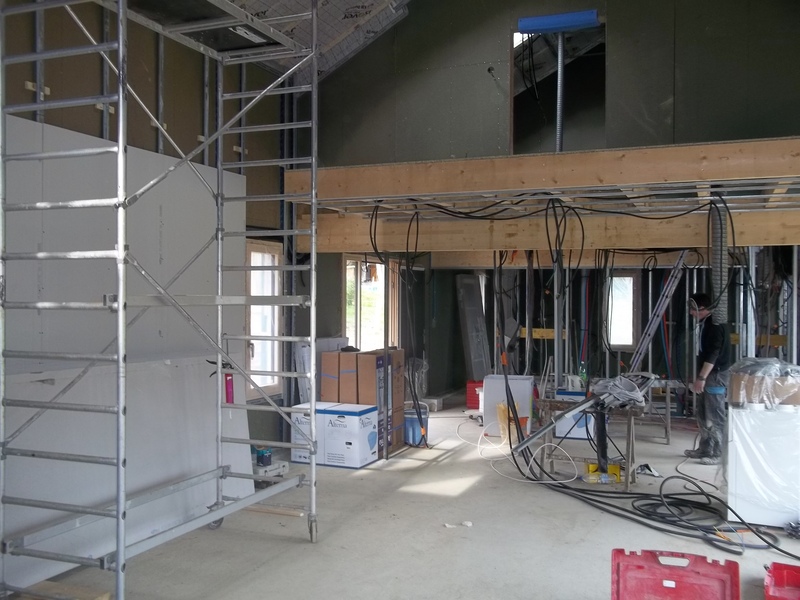 The cladding should be completed by the end of this week and then they will start work on the inside, with the very exciting drylining! We are also tendering for some of the soft landscaping works, including where to buy the hedging plants for the garden and who to get to do the tree works. I think we have made our decision, with help from Al, it is just a question of choosing the correct plants. Due to my background I am very keen that we should have a native woodland style hedge rather than the leylandii and laurel that you see in gardens all over France. We are therefore likely to be planting a mix of blackthorn, hawthorn, hazel etc. These plants will give us colour and the birds fruits and berries. It also means no leylandii or laurel! 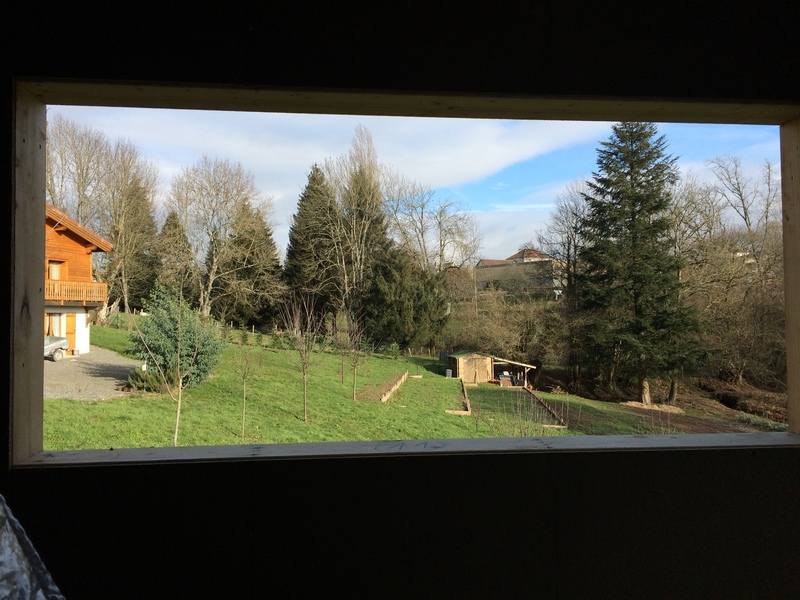 Over the last few weekends, we have been exploring more of France, staying in our general area, but hoping to get a better idea of our surroundings and the Country. We took a long weekend to Bergerac and Perigord, home of good wine, truffles, duck and foie gras. Staying in the most amazing Chambre d’hôte in Beaumont du Perigord, we took a couple of trips out to some wonderful Bastide towns. It made me realise that there is still so much of France to explore and that wherever you go you can always get a decent bag of veg in the local market! Categories: Construction, French builders, House Construction, Landscaping, Marandat | Tags: Cladding, Douglas Fir, hedging plants, laurel, leylandii, Timber cladding | Permalink. The roof is beginning to go on! For the first couple of days this week the builders fitted the purlins on the north and south elevations. Then today they started to fit the Pavatex and waterproof membrane to the north side of the house. 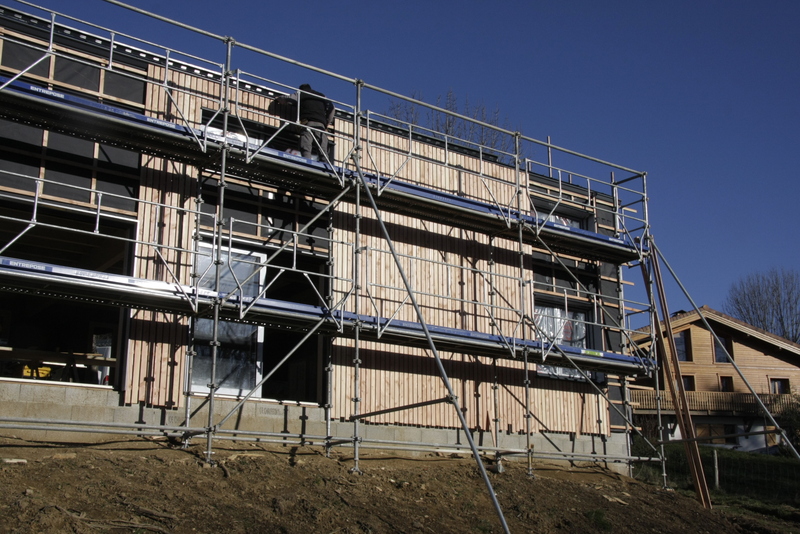 Pavatex is a high-quality insulation made from renewable raw material wood. It also gives better protection against cold, heat, noise and fire. The builders are confident that the north elevation will be finished by the end of the week, but have warned us that the south side will be a lot more complicated because they can’t get the manitou to this side of the house. Therefore, they have to get the materials to this side of the house and on to the roof some other way. 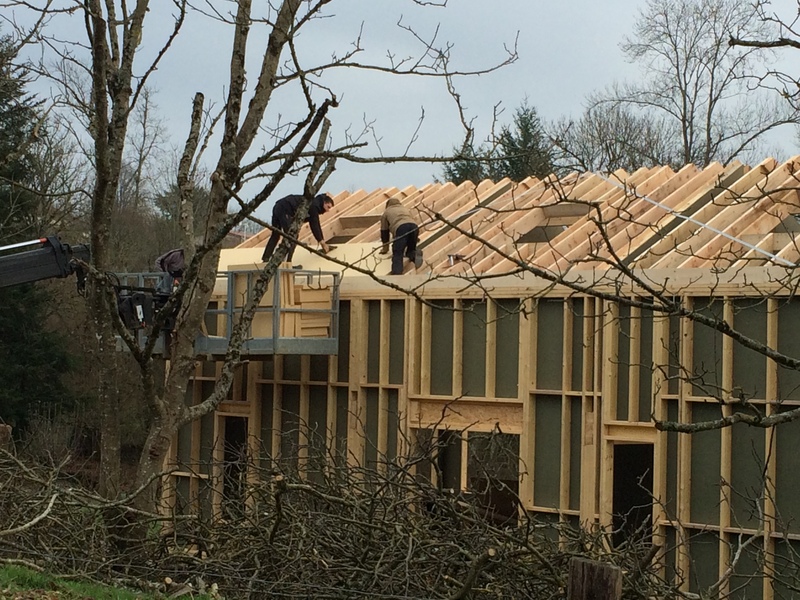 The roof will be clad in timber, but below that there are a number of other materials. Underneath the timber there is lightweight metal roof (crinkly tin ‘in the trade’) to help keep the rain out. Below this is a waterproof membrane (to also help keep the rain out), then woodfibre board (Pavatex), then the purlins with more woodfibre in between. Below this would be our ceiling. I am told this is a fairly standard roof style, but if it keeps the rain out, that is fine with me. There are some particularly interesting ones this week….. Categories: French builders, House Construction, Marandat, Montemboeuf Plot, Timber Frame | Tags: Manitou, Pavatex, Purlins, Roof, The Drifters, Timber roof | Permalink.